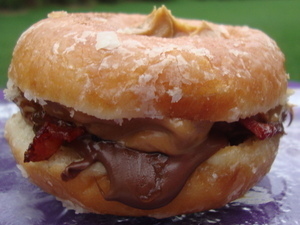 While this sandwich was originally made using Krispy Kreme doughnuts, feel free to enjoy it using your favorite brand of doughnut. This recipe is sure to satisfy the sweet tooth in all of us. Using a serrated bread knife, carefully cut each doughnut in half horizonally. Spread one half (the bottoms) of each doughnut with peanut butter of choice. Spread Nutella on top of the peanut butter. Top the Nutella with four half-slices crispy bacon. Cover the other doughnut halves with apricot all-fruit spread and place spread-side down on top of the bottoms. Grab a handful of napkins and a tall glass of milk, and enjoy!